Editor's note: When a discontinued congregation vacates its campus because of declining membership, it may seem like a death knell. But some hear a clarion call to keep God's work in the house. This is the second in a series of stories about church campuses retooled to continue ministry in the afterlife of a departed congregation. Look for more examples in the weeks to come. 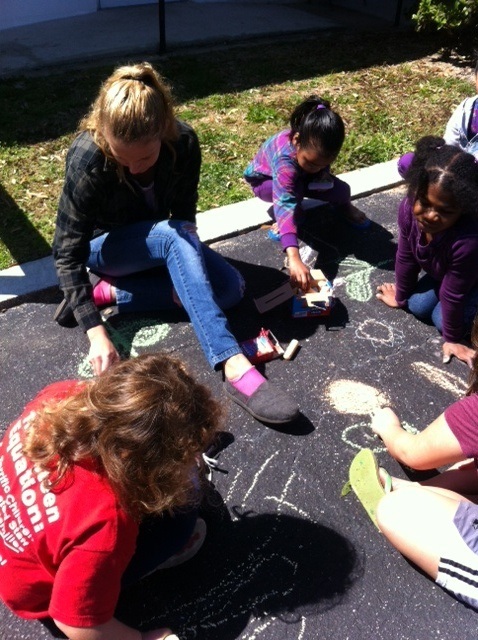 Children make chalk drawings during one of the many activities at Derbyshire Place, a neighborhood center operated by volunteers and members of First UMC, Port Orange. Photos from Derbyshire Place. HOLLY HILL – When Christ UMC closed its doors last year, it seemed to signal the end of a 50-year era of service to the community. A core group of about 20 church members had kept the campus alive for a short while with a thrift shop that sold discounted clothes and household items. Even that became a struggle, and finally the shop and all church activities shut down. First UMC, Port Orange, acquired the church property in July 2013. Now lay leaders from Port Orange are more than a year into a mission to preserve the legacy of Christ UMC by creating Derbyshire Place, an active Christian community center. "It's still kind of a blank slate," says team leader Beverly McGregor. But, she adds, "We felt like this was something God wanted. They (Christ UMC members) didn't want the church to die. We're very happy to try and keep this going." Over several months, volunteers spruced up the former church and installed a new roof. "The facility looked great but needed a lot of work," McGregor says. The next hurdle was how to fund the mission. Good news recently arrived when the Florida Conference's Missional Engagement office awarded a one-year $20,000 grant. In the beginning, though, there was little but faith and volunteers. It helped that a local Pentecostal congregation wanted to rent space twice a week for services. And the thrift shop was revived. "People did want the store to be reopened," McGregor says. The store also serves another purpose in the mostly low-income neighborhood. It sells clothing, furniture, books and household items at discount prices. Many clothing items cost only 50 cents each. The center serves a neighborhood where about 80 percent of children qualify for free meals at school. McGregor says she has noticed that many of the children are being cared for by grandparents. 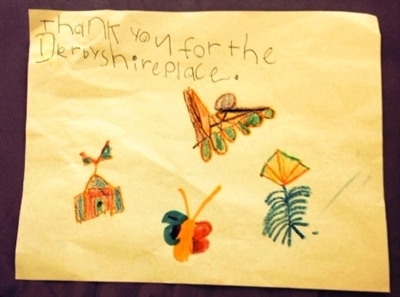 A child's drawing expresses gratitude for the services and caring people of Derbyshire Place. "It helps them out with low-cost items," she says. "It brings people onto the campus so we get a chance to meet and talk with them. Our main goal is to be more involved with children and families." The shop is open from 9 a.m. to 3 p.m. each Friday. Two former Christ UMC members volunteer each week. There is a sense that former church members and families living in the neighborhood are slowly coming around to check out what's going on, McGregor says. "I knew going in there would be some hurt and anger," she says. "We're trying to be a presence in the community. We want them not to see this as an abandoned church or that the Methodist church has abandoned them." On the second Saturday of each month, children are given a snack lunch and invited to play games. The thrift shop also opens up. This month, a fire truck will be on display, and in December there will be a petting zoo. A Santa Shop, also in December, will give children a chance to pick out and wrap gifts for their families at no charge. There is a vegetable garden used to teach children about nutrition. And the church is making connections with Westside Elementary School and the Hope Project, which provides housing for homeless "unaccompanied youth" who are no longer eligible for assistance through the Department of Children and Families. The mission also is reaching out to adults with “The Story,” a 31-week exploration of the Bible from Genesis to Revelation on Tuesday evenings. A DVD presentation of The Story Bible and a study guide is $10 per person. McGregor hopes in future there might be Methodist worship services at Derbyshire Place. She says Methodists there want "to be an example of what a Christian community is." "We're still alive...I'd hope it is pleasing to God."